MozillaZine would be nowhere without you, the visitors. We would like to extend our gratitude to everyone who reads the site, participates in our discussions or contributes news articles. We're especially grateful to those who have donated to MozillaZine or supported us by buying merchandise from our store, though we want to stress that no-one should feel obligated to give. 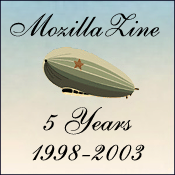 Over the years, many people and organisations have given MozillaZine a helping hand. Some of them are listed below. Thank you all. If you think you should be on the list, your omission probably wasn't intentional. Email webmaster@mozillazine.org, reminding us what you did, and we'll sort it out.